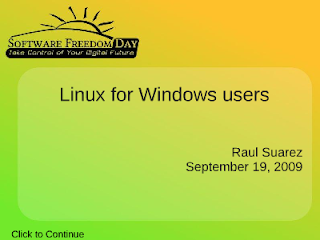 Software Freedom day was celebrated world wide on Saturday September 19. I was fortunate to be able to participate as a volunteer speaker at the event organized by the working centre in Kitchener. Click here to download the impress presentation or click on the presentation to view it on-line. This presentation is not meant to bash Windows in any way or to glorify Linux, but (hopefully) an objective and practical comparison. Hopefully you will be able to attend a local event next year. It was actually Saturday September 19th, 2009. I forgot to give you a copy of the video!